Boseong Green Tea Field | Stories from far away.. The sky was darkening with rain and my skin was instantly wet with humidity and sweat as I hopped off the bus and up the road to the lodge above the Boseong Green Tea Field. All my senses were awakened – through the thick moisture of the air a strong, fresh minty smell filled my nose, intense lush greenery as far as the eye could see, and a calm stillness surrounding the road. This place is stunning; I kept thinking this is what it must feel like to overlook a valley in Ireland. The whole area may as well have been a backdrop at a cheesy photo studio and I wouldn’t have known the difference. 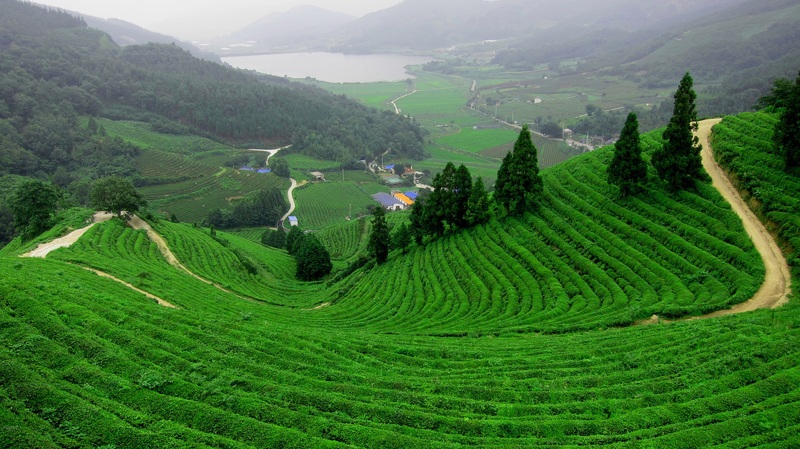 Apparently 40% of Korea’s green tea supply comes from these fields, and Boseong Green Tea passed the strict quality inspection of the Russian Medical Biology Lab, and was officially recognized as a beverage suitable for an astronaut’s special diet. Slightly interesting, VERY random fact about tea.. There is absolutely no better way to spend a Tuesday, as I peer out the floor to ceiling windows where I sit on the floor consuming my green tea and green tea ice cream fresh from the fields below.